One of the crunch points for writers comes right after the first draft. It’s commonly understood that once the first draft is done what is needed is some editing. This is most usually thought of as minor rewriting and fiddling with grammar and perhaps paragraph order. But sometimes a piece of writing requires much more than this. It requires radical textual surgery – cut and cut again. I’m always prepared to dismember my writing if it means something better results. I’ve been known to come to a co-writer saying that what we currently have as one chapter is actually two, or that what is in a chapter just isn’t right and we need to start again, or that we need to move really major sections around a whole text. I’ve been known to suggest to co-editors that several commissioned chapters don’t fit our text and need to become a special issue rather than be in our book, and that we need to find a whole set of new chapters. The people I work with also do this, and so they understand the need for this kind of drastic action – we can therefore always talk these things through and resolve them. The first decision after a first draft is not about minor editing or revision. Rather, it’s about whether there is a need for something dramatic. This may well of course NOT be needed. Well and good. But what if it is? What if you read the draft and then get the sense that all is not well? Often when I hear writers talk about anything other then relatively minor editing, it’s as if they have somehow failed. They often express fear of ‘losing’ words. It is as if the words are somehow irreplaceable. By implication, they are also suggesting that writing to find out what you think and how best to say it is a waste of time. They also suggest that they may not be able to get the writing done again. The preparedness to write over and over – as with my co-writers and co-editors and other productive writers that I know – is because I/we don’t see words as a finite resource and writing as something precious which when produced, needs only to be ‘edited’. We think of words and writing more like, well, like The Magic Pudding. Let me explain a little more for those of you who haven’t encountered this most distinctive of Australian children’s books. As a child I used to love the book The Magic Pudding (now available free to all via The Gutenberg project). Written by Norman Lindsay, otherwise known as a somewhat risqué Australian artist, The Magic Pudding tells the story of Bunyip Bluegum, a young koala who leaves home to have an adventure. Setting out somewhat unprepared in the morning, Bunyip finds himself hungry by lunchtime and fortuitously encounters Bill Barnacle (a sailor) and Sam Sawnoff (a penguin) eating from a delicious pudding in a basin. Now the key thing about the Magic Pudding is that it never gets any less. No matter how much it is eaten it remains a complete pudding. Unlike oil, or coal, or many other natural resources, the Magic Pudding replenishes itself continually. A peculiar thing about the Puddin’ was that, though they had all had a great many slices off him, there was no sign of the place whence the slices had been cut. ‘That’s where the Magic comes in,’ explained Bill. ‘The more you eats the more you gets. Cut-an’-come-again is his name, an’ cut, an’ come again, is his nature. Me an’ Sam has been eatin’ away at this Puddin’ for years, and there’s not a mark on him. So lets think of the pudding as a metaphor for words and writing. You can’t use words up like you can oil. They are still there after you’ve used them, waiting to be used again and again. And there are lots of them. So many in fact that none of us use them all. We tend to use the same ones repeatedly. It’s certainly not the case that if we cut and cut again there wont be any more words to replace them. With words it’s also cut and come again; we can always put more words back where the ones we discarded used to be. It’s not question of loss in writing, but rather one of working to produce the right words, getting the writing right. And this is the actual concern, not the loss of words or writing per se. They found a comfortable nook under the hedge, where there were plenty of dry leaves to rest on, and there they built a fire, and put the billy on, and made tea. The tea and sugar and three tin cups and half a pound of mixed biscuits were brought out of the bag by Sam, while Bill cut slices of steak-and-kidney from the Puddin’. After that they had boiled jam-roll and apple-dumpling, as the fancy took them, for if you wanted a change of food from the Puddin’, all you had to do was to whistle twice and turn the basin round. The pudding is able to be transformed. And just like the pudding, the thing about words and writing is that they are also able to change – to do and be different things. Words are very malleable. Like clay – and not like fabric or stone – we can cut them and come again. We can mold writing and words, slice them up, bash them around, and rework them until they form a shape that is pleasing. The problem for writers is that it can seem harder to change the writing than whistling twice and turning the pot around. I want to suggest however that maybe it isn’t as difficult as we like to think it is. If there are plenty of words, and if we are sensible people with sound research and something to say, then it is a question of perseverance and refining and honing the skills of radical textual surgery AND editing. I’m not a great fan of that brand of pop psychology that suggests all you have to do is believe you can do it and you will, but I do see a lot of people who believe that they can’t do it, and they don’t. For most self-doubters it might be helpful to see losing words and hacking the writing about and producing more as rather like living with the magic pudding. Something interesting and open-ended and full of possibility, rather than scary and sad. Bill Barnacle and Sam Sawnoff the penguin belong to the Noble Society of Pudding Owners. I’d like to think that we can all join the Noble Society of Word Users – and just like Bill and Sam, cut and come again. My point is that there is actually NOTHING to be lost from trying radical textual surgery. You can keep the original file so it’s not gone. You can have a few goes at a new version. There is everything to gain – and nothing to lose but a bit of time – from having the courage to refuse to accept writing that deep down you know isn’t right. So consider the magic pudding when facing that first draft. If it feels like it’s terrifying to even contemplate cutting anything, think of the writing and the words able to withstand whatever treatment you hand out. Cut and come again is a motto to hold onto. 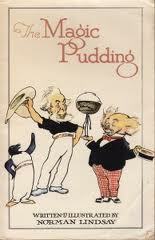 This entry was posted in academic writing, editing, revision, rewriting, words, writing and tagged editing, metaphor, Norman Lindsay, Pat Thomson, revision, rewriting, The Magic Pudding. Bookmark the permalink. It is in the re-drafting that the learning happens. Great post, thanks. I keep ‘angels and petals’ files where I cut and paste anything half way decent but which doesn’t belong in the chapter I’m working on. It hurts less to cut, knowing that I can easily find it again. The title is just a pretty name – better than the Rejects or Oddsnbods file. So the file might be titled AngelsandPetals soap consumption.doc or AngelsandPetals: futurism or whatever the topic is.